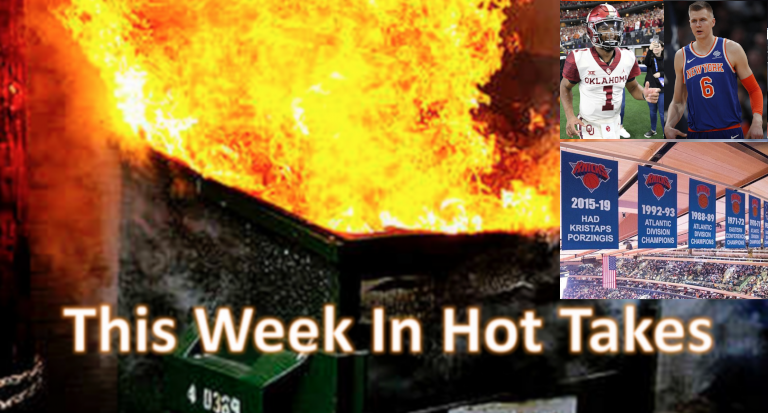 This Week In Hot Takes: Dan Dakich claims "if you draft Porzingis, you'll regret it" was "100% accurate"
Welcome to another edition of This Week In Hot Takes. This time, we’re breaking down the hottest takes from sports media members from Jan. 25-31, many of which centered on the New York Knicks’ stunning trade of Kristaps Porzingis Thursday. Best day for @nyknicks in over a decade and the fan base is complaining. Huh? You now have a future star (Knox), room for two FA stars, and a shot at potential mega star (Zion). And you’re unhappy? Did you really want to sign the brittle Porzingis to a max deal? Pass. “Knox” is rookie Kevin Knox, who didn’t seem too thrilled about this on Twitter, but who more notably currently has an 8.97 PER, ranking him 27th of 35 qualified rookies. He’s only 19, so maybe he will turn into something, but calling him a “future star” seems a bit much at this point. If the Knicks didn't KNOW they were getting two max players in free agency this summer, they'd have kept Porzingis and tried to make it work. But they dealt him so they know. I'd say KD is one for sure. Do we get to body slam Smith instead when that doesn’t happen? Or just continue to laugh at him? 3. Lance Zierlein brings up “kidnapped mom” in NFL draft discussion of Kyler Murray: Moving away from the NBA for a short moment, NFL.com draft analyst Lance Zierlein gave us one of the most bizarre arguments for a draft pick in a long while, saying that you’d pick Kyler Murray…if your mom was kidnapped and the only way to free her was picking a 2019 quarterback to win one game? Before you slander K Murray as an early first rounder, please play a game with me. It's called "Kidnapped Mom"
There are lots of good arguments for Murray, but that isn’t one. For one thing, the “to win one game” idea is often used by sports pundits, but it’s absurd; there’s not much evidence that professional athletes play better in any particular game, so the best way to find someone “to win one game” is to find someone who’s skilled and wins a lot of games. Even if you embrace that part, though, wouldn’t there be some other important factors to consider here before choosing your quarterback, such as whoever’s on this quarterback’s theoretical team, what their offensive scheme is, and what kind of a defense they’re playing? But the really ridiculous part is bringing the “kidnapped mom” into it. Talk about exaggeration for effect. Where can you get a doctorate in winning? Sheen University? Also, last we checked, basketball was a team sport, and the Knicks haven’t exactly built much of a team around Porzingis. He’s been a terrific player, but his team hasn’t, and win-loss records are a terrible way to evaluate individual players. 1. Dan Dakich claims his “if you draft Porzingis, you will regret it and never get out of the lottery” take was “100% accurate”: The funniest and hottest take this week came from Dakich, the Indianapolis radio host and ESPN personality, who cited the Porzingis trade as…vindication that his pre-draft Porzingis-bashing on Ryen Russillo’s show has now been proven correct? Let’s break that down. The “never get out of the lottery” part is the same “team records apply to individual players” fallacy Vaccaro is arguing for, but the “if you draft him you will regret it” is the really hot take. How could the Knicks possibly regret it at this point? As mentioned above, the only other player from that draft class to make an All-Star team so far is Towns, who went first overall and wasn’t available at the fourth slot. D’Angelo Russell (second overall) might make the All-Star Game this year as an injury replacement, but he also wasn’t available at #4, and Porzingis has had a better career than both Russell and third-overall pick Jahlil Okafor so far. And of the guys drafted after Porzingis who were actually available as other options, it’s pretty hard to argue right now that the Knicks would have been better off with Mario Hezonja, Willey Cauley-Stein, Emmanuel Mudiay, or Stanley Johnson (picks 5-8), or any player chosen after Porzingis, really. And while Dakich wasn’t the only one to criticize Porzingis at the time (for example, Stephen A. Smith got real mad about that pick), at least most of the others eventually came around and realized that Porzingis was a great player. But sure, “as ALWAYS” Dakich was “100% accurate.” This is the “Again I’m right in my analysis” of basketball, and it’s working out about as well for Dakich as it did for Jeremy Roenick. Even Russillo laughed at him. For taking a victory lap over predicting that Porzingis would be a bad draft pick when he was anything but, we award Dakich the hottest take of the week. 100% accurate indeed.